How does the EdTech community enable the future of learning while removing the obstacles to better uses of technology today? To answer this question IMS Global Learning Consortium invited organizations that are leading substantial stakeholders in solving the problems of today while establishing the technical foundation for support of digital learning into the future. The set of talks were recorded for all to see. They are highly motivating and yet very pragmatic in terms of highlighting how the landscape of #EdTech is changing through a developing ecosystem of innovative and connected products. IMS Global members are putting in place the foundation for next generation digital learning through 5 interrelated initiatives. Rob Abel kicks off the 2016 Learning Impact Leadership Institute with an overview of the progress being achieved by 365+ IMS members to create an open ecosystem to enable better learning from better learning technology. Rob Abel shares his perspectives from within IMS on how next generation digital learning is being invented with emphasis on how learning and interoperability are inseparable. EDUCAUSE and IMS Global have a long history of partnering to address the challenges of today and moving the education community forward towards next generation digital learning. John and Malcolm share insights from an EDUCAUSE Research Report funded by the Bill & Melinda Gates Foundation that outlines the principal domains for supporting next generation digital learning environments (NGDLE): interoperability; personalization; analytics; advising and learning assessments; collaboration; and accessibility and universal design. Since no single application can deliver in all of the domains, this talk outlines a "Lego" approach to realizing the NGDLE. Representing the ISTE organization, a key IMS partner in K-12, Trina Davis reviews the evolution of the ISTE standards from an early focus on how to use the technology to how to amplify learning with technology. 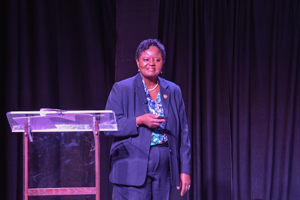 Her talk also highlights for district leaders the importance of alignment of the IMS and ISTE standards to support new learning environments. Jon Mott from Learning Objects, a leader in the ed tech community, takes us through some interoperability and articulation challenges students routinely face as they navigate their education journey to get to where they want to go. Jon challenges us to think outside of the box to empower and enable students to achieve their life goals. 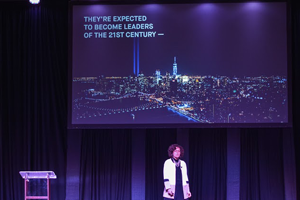 The CEO of Collective Shift, a key IMS partner in the area of open badges, shares her perspectives about that the challenge facing education is to create new learning models that connect passions, peers, and opportunities in the real world. Models that that capture learning wherever it happens and to make the learning count to better prepare our students to succeed in the 21st century. Personalization is not going to happen overnight. It's going to take time. Dale shares his perspectives from an institutional perspective that the promise of personalization is that we will all stick it out to advocate for the data and science that is needed to support personalized learning. Arizona State University, an IMS Contributing Member, is a recognized leader in ed tech innovation to support today's students. D2L, a leader in the IMS Global community collaboration, share's their perspective of how the LMS is evolving from a focus on “feature sets” to a focus on openness. A learning environment that provides teachers with the choice of the tools they want to use and simplifies how those tools are incorporate into the broader learning environment to drive learning impact. SAFARI Montage, a leader in driving adoption of open standards in K-12, understands that to make the transition from traditional learning to digital age learning requires a district-wide culture change and commitment to open standards. Tim Beekman outlines the key characteristics that he sees in those districts who are successfully making the transition to digital age learning. Moodle is an IMS Contributing member and recognized leader when it comes to innovation and supporting open source to enable experimentation and discoverability. In this talk, the CEO of Moodle challenges viewers not to think of next generation digital learning as something that can be designed as the one thing to solve all of the problems facing education, but as a journey towards the future of education that supports learning both inside and out of the institution. Interoperability, analytics, personalization, collaboration, and accessibility are all vital to creating really good accessible, interactive content that can meet the learner wherever they are in the learning process. 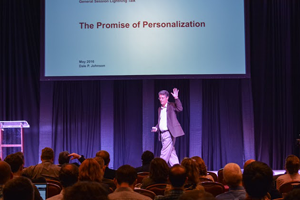 Representing VitalSource, an ed tech leader and supporter of IMS, Rich Johnson shares a view of what can be done today to personalize learning and possibilities of the future from the content perspective. A panel of K-20 institutional leaders share their reactions to what they heard from the lightning speakers and share their expectations of what is needed from the edtech community to realize next generation digital learning in order to better prepare our students today and in the future to succeed.